Is cancer an epidemic in America? A friend and I were looking back at 2011. She remarked about all the cancer she's seen this year. Last month she lost a close friend -- a woman in her 30s. Another friend, 40, has bladder cancer for the second time. My step-mother recently made a similar remark about cancer in my own family. She lives on the other side of the country and the family is scattered all over the globe. One brother-in-law has stomach cancer which has metastasized, and many of us are cancer survivors (including me (bladder, 2007)). And on my own newsletter list I know of a number of ongoing cancer cases as well. It feels like an epidemic, but of course, the epidemiologists who work for the state or the federal government would undoubtedly tell us they can't discern anything "statistically significant" (they love that phrase!) from our "data" -- it's just a few random points, it doesn't show a trend. That's true of course -- but we're talking about real lives of our friends and families, not raw, impersonal numbers. We're looking for answers. The epidemiologist will also point out that cancer will strike about one in two Americans at some point in their lives, and will be the underlying cause of death for somewhere between one in four, and one in three of us. So they're not really looking for an epidemic. They're looking for a worsening trend within an ONGOING epidemic. Baseline radiation values vary enormously from one location to another. Accurate data isn't available. By the time something is occurring so frequently that researchers find it to be "statistically significant," it might already be killing tens of thousands of people annually, or even more. As an example, it took thousands of carefully-done studies to show there was a legally-defensible, statistically-significant connection between cigarettes and lung cancer, heart disease, throat, lip, esophageal, stomach, colon, and rectal cancer, and low birth weight among the babies of smokers. All these and many additional health effects are now well-established, yet each connection was hard to prove. But even today about a billion people think the statistics are wrong, or that they don't apply to them for any of about a billion reasons. They smoke anyway (including my friend, who's excuse is that she only smokes one or two cigarettes a day). Radiation deaths are far more difficult to prove than smoking deaths, because the source is almost always unknown in its quantity, who it was delivered to, and when. A two-pack-a-day smoker knows he or she is a two-pack a day-smoker. Who got what dose from Fukushima? Nobody knows, not even in Japan. So proper epidemiological studies will be nearly impossible to accomplish. Three radiation experts -- Robert Alvarez, Joseph Mangano, and Janette Sherman -- have made an attempt to calculate Fukushima's impact. They estimate that nearly 14,000 excess deaths may have occurred (including over 800 infants) in America in the first few months after Fukushima (see below). The nuclear industry will tell you they don't see anything unusual going on. They'll remind you that: "No one was harmed by Three Mile Island." Independent studies indicate otherwise. They'll remind you that: "No one has ever been harmed by living downwind of a properly operating nuclear reactor". Again, independent studies indicate otherwise. And they'll tell you that: "Hardly anyone was harmed by Chernobyl" but again, independent analysis indicates as many as a MILLION people have already died because of Chernobyl! And of course, they'll say that: "No member of the public was harmed by Fukushima" but they'll be wrong about that, too. People don't like to talk about cancer. But ever since cancer "came out of the closet" about forty years ago, it's felt like an epidemic even though the obituaries stopped routinely listing the CAUSE of death -- about thirty years ago! Independent studies of cancer clusters have become much more difficult since we all started clamming up about who we are, where we live, where we work, and so on. Studies are even more difficult because we move so often, change jobs and companies, partners and eating habits. And when a victim does manage to reach a settlement with a polluter, the terms and conditions are invariably kept secret, making the clusters that much harder to find for everyone else. My friend is not a nuclear activist and wasn't talking about Fukushima and its aftermath. She just was wondering why so many people seem to have cancer these days. "Could be Fukushima" I said. "Where will we get our energy?" she asked. I answered that San Onofre only supplies about 7% of California's power, which could easily be replaced by solar, wind, etc.. If I had more time, I would have made her aware of some other considerations besides just where our electricity will come from. They do. So do plate glass windows in high-rise buildings, and so do cars, trucks, busses, trains and airplanes, deforestation and climate change -- but no one seems to care about those! Only wind turbines. And there are a variety of ways to increase wind turbine blade visibility to birds, ways to site them and so on, that can greatly reduce the incidence of bird strikes. "You'd have to cover the whole country with solar panels!" Not true! Actually an area in the southwest approximately 100 miles on each side would be enough -- and much of that can be found on existing rooftops, which are mostly just tar-covered, wasted space anyway! "Hydroelectric power damages the river life." You can install anything improperly if you like. Or you can build fish ladders, you can control the water levels in the rivers appropriately, you can locate the dams properly and make existing dams more efficient and so on. "Mining for Rare Earth Elements (REEs) is extremely polluting -- but all the renewable energy sources needs REEs!" That's right: For example, they need "permanent" magnets made of REEs. However, these are 100% recyclable! And don't forget that "rare" is just a name: These elements are fairly abundant, actually. "Nuclear power has worked for 50 years." No it hasn't! Accidents have been covered up, and when that isn't possible, they've been swept from the front pages of the news even as they're still happening! Fukushima is no longer the top item in the news each day, and yet it's an ongoing tragedy -- the most massive single environmental catastrophe the world has ever seen -- and capable of an even-more catastrophic "hydrovolcanic explosion" if any of the molten cores hit the water table underneath. "They've solved the nuclear waste problem, it's just a political issue now." Completely false! In fact, the Yucca Mountain scientific team was allowed to come up with ANY scientifically-viable alternative to Yucca Mountain if they could. They only thing they couldn't consider was the same thing in a different location. They couldn't come up with anything else that would work, and neither will Obama's "Blue Ribbon Committee." Nothing else works any better than Yucca Mountain would, but Yucca Mountain wouldn't work, either: It's geography is unstable, it suffers from water seepage, the population centers nearby are too close, transporting the waste there would be a nightmare. Unfortunately, any OTHER location will have the same problems, or worse! Therefore, the only solution to the nuclear dilemma -- and it's a partial one -- is to stop making more waste. But unfortunately, the average adult in America has no idea what "radiation" is. They don't know an element from an isotope from a molecule from a sub-atomic particle, and couldn't care less. The word "epidemiology" causes their eyes to glaze over. And cancer scares them. How will it be possible for a "democratic" society (let alone any other) to fulfill its promise to protect its citizens, when those same citizens are ignorant of the dangers they face? When the problems are too complex to grasp in a sound bite? When there is always an opposing view, who usually sounds just as passionate or more so (after all, their livelihoods are usually at stake)? My hope for 2012 is that the world will educate itself more about the problems it faces. It is our duty to our children to learn how to protect them. My friend has a wonderful child. But she is probably unaware that radiation harms young children at roughly 10 times the rate it harms adults. Infants are a hundred times more vulnerable, and fetuses a thousand -- or thousands of times -- more so, because their cells are differentiating. The Nuclear Age has been an epic failure so far, and is destined only to be more so in the future. A third of a trillion dollars are projected to be put into a dozen (or more) genocidal, environmentally-devastating nuclear-armed and nuclear powered submarines for the next generation to play war games with. Then those sailors will need jobs in the industry. Same as now. But nuclear weapons have not prevented war, as was promised, and nuclear power plants have only made us vulnerable. Electricity has not been "too cheap to meter," as was also promised. Nothing's worked out for the nuclear industry -- except their ability to fool the public. After 2011, the world is three meltdowns more polluted than it was in 2010. It also has about 20,000 tons of NEW "High Level Radioactive Waste" from ~500 commercial reactors still operating around the world. This new "HLRW" waste (mostly used nuclear reactor cores) is about ten million times more hazardous than before it was put in the reactor (and it was no picnic then, either). TEPCO, the owner of the stricken reactors, lies constantly. The reactors spew radioactive waste constantly. The Japanese government lies constantly. No one knows what's really going on anyway. Everyone is now admitting that it will take "40 years" to put Fukushima into "Safe Store", a fictitious state of temporary nuclear bliss. The author has been writing about nuclear power for a number of decades. His book on the subject, called The Code Killers, is available from his personal web site: www.acehoffman.org . He also writes educational software using animation as a teaching tool. His software products, as well as many free educational animations about nuclear issues, are available at: www.animatedsoftware.com . This report, "An Unexpected Mortality Increase in the United States Follows Arrival of the Radioactive Plume from Fukushima: Is There a Correlation?" published in the International Journal of Health Sciences today, is not new science, but confirms research done over the decades as to adverse effects caused by radioisotopes to the unborn and the very young because of their rapidly developing cells, immature immunological systems and relatively small weight. As background, in the 1950s, I worked for the Atomic Energy Commission (the forerunner of the Nuclear Regulatory Commission) at the Radiation Laboratory, University of California in Berkeley and the US Navy Radiation Laboratory at Hunter's Point in San Francisco. Near 60 years ago, we learned that radiation could damage animals and plants and cause cancer, genetic damage, and other problems. 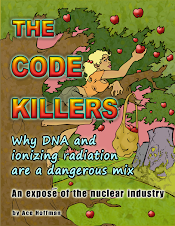 The issue of the danger from nuclear power plants is not just the engineering, but biology and chemistry. We have understood for decades where and how radioisotopes interact with life systems. Cesium-137 and Strontium-90 have half-lives of approximately 30 years. It takes 10 half-lives for an isotope to fully decay, thus it will take 300 years or Three Centuries before radioactive cesium and strontium will be gone. Cs134, Cs-137 and Sr-90 continue to be released from Fukushima in tons of contaminated water that is making its' way across the Pacific Ocean. Cesium concentrates in soft tissue, strontium in bones and teeth, of the unborn and young. (I-131) released from Fukushima, thyroid disease will develop in those exposed in Japan, as well as in those exposed to lesser amounts throughout the northern hemisphere. Public health officials need to anticipate and prepare for these findings. Not every system was evaluated after Chernobyl, but of those that were: wild and domestic animals, birds, fish, plants, fungi, bacteria, viruses - even humans - were altered by the radiation, often for generations. Recent, independent studies conducted in Scandinavia shows a decline on academic performance in children exposed during the Chernobyl fallout. 80% of children in Belarus are considered un-well by government standards. Unless the earth stops turning, and the laws of biology, chemistry and physics are rescinded, we will continue to see sickness and harm spread to the children of Fukushima, the same that occurred after Chernobyl. We ignore history at our peril.